My latest adventure has been eating with complete strangers while having the best meal of my life. 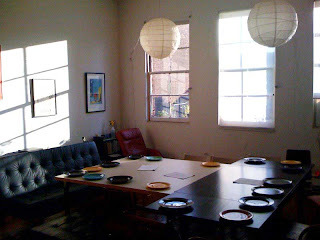 A rough description of a supper club: It's a monthly 'pirate restaurant' held in houses, lofts, and borrowed space. Instead of making reservations at a permanent establishment, you paypal the host and wait for an email disclosing the location of the dinner party. Usually 3 to 5 courses are served and dishes are made from local farm markets. Seriously amazing food. 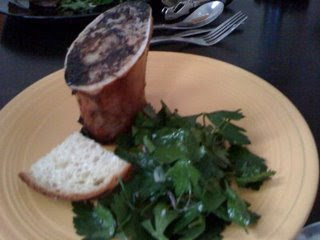 Bone Marrow: I grew up on this. Bone marrow is basically the soft tissue found in the interior of bones. Use a fork or knife to poke the center marrow out. Smear it on a piece of toast, add a pinch of salt for flavor, and enjoy the delicate flavors. It's fatty and jelly like in texture, but high in iron. Went deliciously well with Winnie's side parsley salad with cilantro. Roast Beef: Although not on my list of adventurous, it is just an awesome sight and conquest to cook perfectly medium rare! Can you see the fat marbling on the rump roast? Wow.